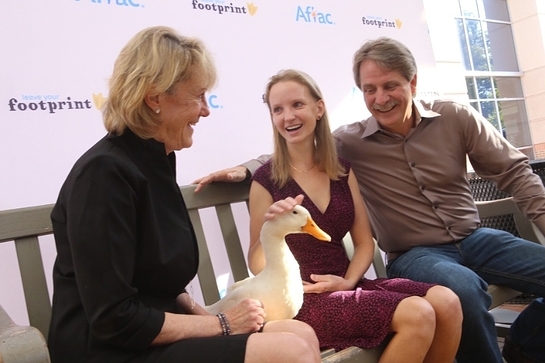 Aflac, the leading provider of voluntary insurance at the work site in the United States, today honored three heroes who have left a giant footprint in the fight against childhood cancer. At the same time, the company celebrated a major milestone, exceeding the $100 million mark in contributions to the Aflac Cancer and Blood Disorders Center of Children’s Healthcare of Atlanta, a nationally renowned children’s cancer facility. The three honorees, nationally recognized comedian, author and television personality, Jeff Foxworthy, Ansley Riedel, a nurse at Children’s Healthcare of Atlanta who was treated at the Aflac Cancer Center as a child and Ansley’s mother Vicki Riedel who successfully petitioned Aflac to sponsor the Aflac Cancer Center in 1995, saw their footprints added to the Duckprints Wall of Fame at the Aflac Cancer Center. The event was hosted by national television sports commentator Ernie Johnson, Jr., himself a cancer survivor. According to the American Cancer Society, the five-year survival rate for childhood cancer today exceeds 80 percent compared to less than 60 percent in the mid-1970s. And while cancer remains the most prevalent cause of death by disease for children, only a small percentage of government cancer funding goes toward childhood cancer. Each month, Aflac’s independent sales associates contribute from their commission checks to the Aflac Cancer Center. Due in large part to this steady stream of research and treatment-related funding by Aflac agents, the center is currently recognized by U.S. News and World Report among the top 10 of pediatric cancer programs in America. Twitter – $2 for any tweet using the hashtag #Duckprints or for retweets of Duckprints-related tweets. Facebook – $2 for any share of specific posts related to Duckprints or using #Duckprints. YouTube – $2 per view of the Duckprints videos on YouTube. Instagram – $2 for every post using the hashtag #Duckprints. 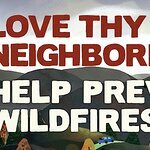 Aflac also created a website (aflacduckprints.com) that enables users to nominate unsung heroes in their community who have made a difference in the lives of children and families facing cancer. People can follow the Aflac Duck on his journey to hospitals around the country honoring those who have made a difference in the fight against childhood cancer. In addition, merchandise such as plush Aflac ducks and Duckprints-related T-shirts, slippers and other items will be available for purchase at aflacduckprints.com, with all of the net proceeds going toward the treatment and research of childhood cancer.